Wireless microphone, consists of two parts, transmitter and receiver, usually called wireless microphone system. The transmitter is battery powered and the microphone transforms the sound into an audio electrical signal that, after being processed by internal circuitry, emits radio waves containing audio information into the surrounding space. The receiver is generally powered by the mains. The receiving antenna receives the radio waves from the transmitter. After being processed by the internal circuit, the receiver extracts the audio signal and sends it to the sound reinforcement system through the output signal line to complete the wireless transmission of the audio signal. A receiver usually can contain 1 set, 2 sets or 4 sets of receiving circuits, respectively, to receive 1, 2 or 4 wireless microphone signal, of which two are the most common. 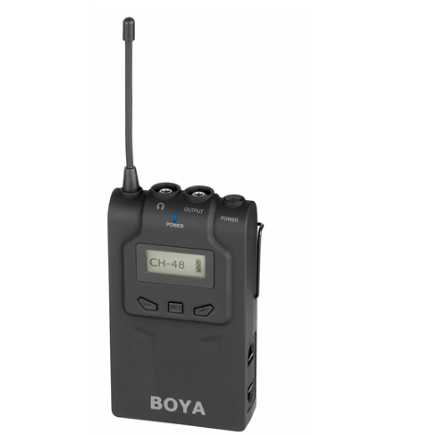 The BOYA BY-WM6R is a compact and rugged beltpack audio receiver, it work as Receiver A, compatible with BY-WXLR8, BY-WHM8, BY-WM6 transmitter and BY-WM8T( Transmitter sold separately). One of the most common decisions musicians face is picking wired or wireless microphone. Having a microphone is a great leap forward for musicians, but choosing a wired or wireless solution is hard to decide. The simplicity of wired microphones is an advantage, while wireless microphone benefits active performers. Finally, personal preferences often determine the final choice. Do you want to get rid of the mic cable? I asked this question because for some, the answer is! Enough for them to decide to choose a wireless microphone. The wireless microphone offers greater freedom of the stage and special interaction with the performance environment. If you are an energetic performer and want to be free to play on the stage, getting out of the mic's cable limit will make you feel very free and fun. As you can see above, choosing a wireless microphone does not require you to worry about damaging or disconnecting the cable during the show. (I've been to many punk performances and I've seen many XLR cables come to an end.